Court transcription keeps judges and lawyers well informed of what’s going on in a trial and gives them a resource to turn to when they need clarification of details. The court reporting technology that Court Scribes uses today is state-of-the-art, but the skill of recording court proceedings is an old one that has been practiced for more than a century. As a matter of fact, even one of the 19th Century’s most famous authors got his start in writing as a court stenographer, the San Diego Reader said. None other than Charles Dickens, author of A Christmas Carol, Oliver Twist and Great Expectations, among other classic books, worked as a law clerk, and his tasks included delivering documents and running errands. He soon became bored with the low-level duties and decided he wanted to be a court stenographer. Court stenographers recorded the proceedings of a trial in a shorthand system called Gurney, which could take three years to learn. But Dickens mastered “that savage stenographic mystery” in three months, per the Reader. After he met that challenge, he became skilled in stenography but wanted to take his career a step further. Soon he began covering Parliament for his uncle’s newspaper, reporting on debates between politicians. His experience in the courtroom and in Parliament exposed him to many different kinds of people whose personalities and accents he later captured in his novels. He also learned to work quickly and was able to produce 15 novels in his lifetime, including the unfinished book The Mystery of Edwin Drood. Dickens died of a stroke on June 9, 1870. He is regarded by many as the greatest novelist of the Victorian era, and his books are still widely read today. 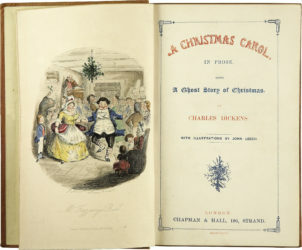 This time of year, many theaters stage productions of his story A Christmas Carol, featuring well-known characters Ebenezer Scrooge, Bob Crachit and the ghosts of Christmas past, present and future. He is recognized by 21st century critics and scholars as a literary genius.